Looking to build a small display table for your home? Then you’ll enjoy our upcoming Harp Leg Half Table woodworking plan. This plan is the perfect change of pace when it comes to lumber usage, machining, assembly, and finishing options. We are proud to announce this new woodworking plan will be introduced in early 2015. Click to zoom in on detail of table. 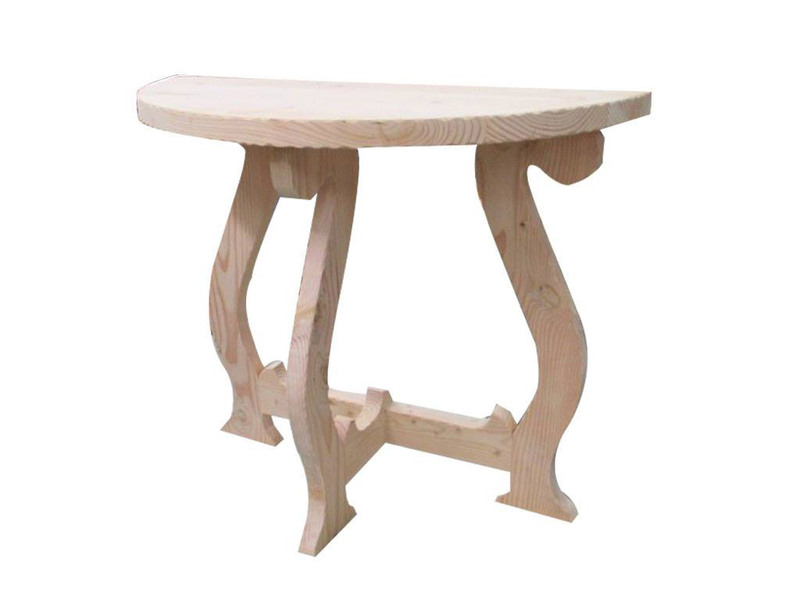 The Harp Leg Half Table is perfect for indoor or outdoor application when suitable lumber and finish is used. It’s ideal for foyers or virtually anywhere else in the home where a small, stylish table would enhance the décor of a room. The photo model below was made of recycled construction material. The top is an edge glued panel construction and stained with a polyurethane finish. 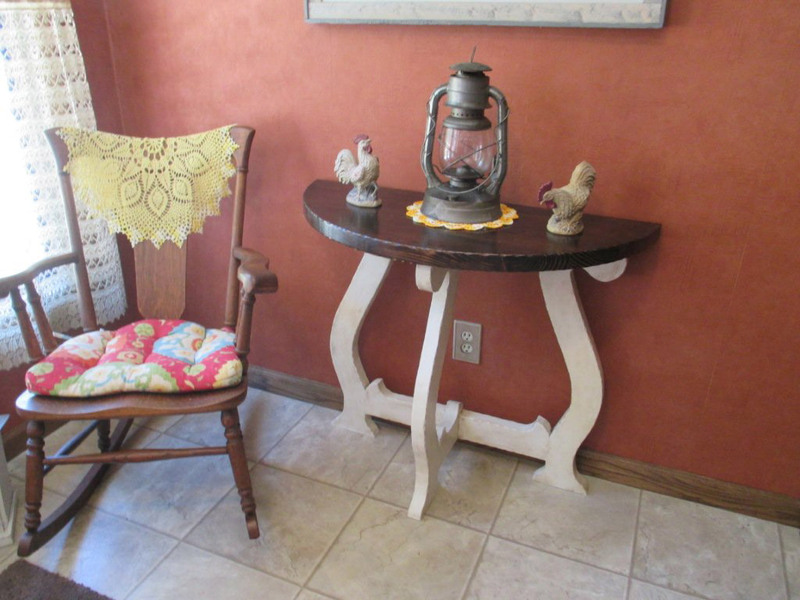 The bottom is finished with chalk paint with a wax (clear and dark) finish. Finished photo model. Click to see detail. This new woodworking plan will provide full-size patterns for the legs and bottom braces, and will allow the parts to be cut out on a 14”-16” band saw. As always, the plan will also include both illustrated and written assembly instructions to ensure an easy and enjoyable project for all builders.This plan will even provide useful tips on making a simple band saw support table for ease of cutting the legs, braces, and the half round top. Basic woodworking machinery and tools will be required to complete this project, along with a table saw, 14″ to 16″ band saw, table or floor drill press, bar/pipe clamping, and miscellaneous hand tools. The finished table dimensions are 36” width x 16” depth x 30” height. The Harp Leg Half Table woodworking plan is an easy to medium project plan. We’re sure the finished half table will be something you’ll be proud to display in your home, give as a gift, or even sell in local shops and craft shows. I already have 4 requests for tables and I’ve only had the model done for a few days. What have I done?! Click here to see all Klockit woodworking plans!